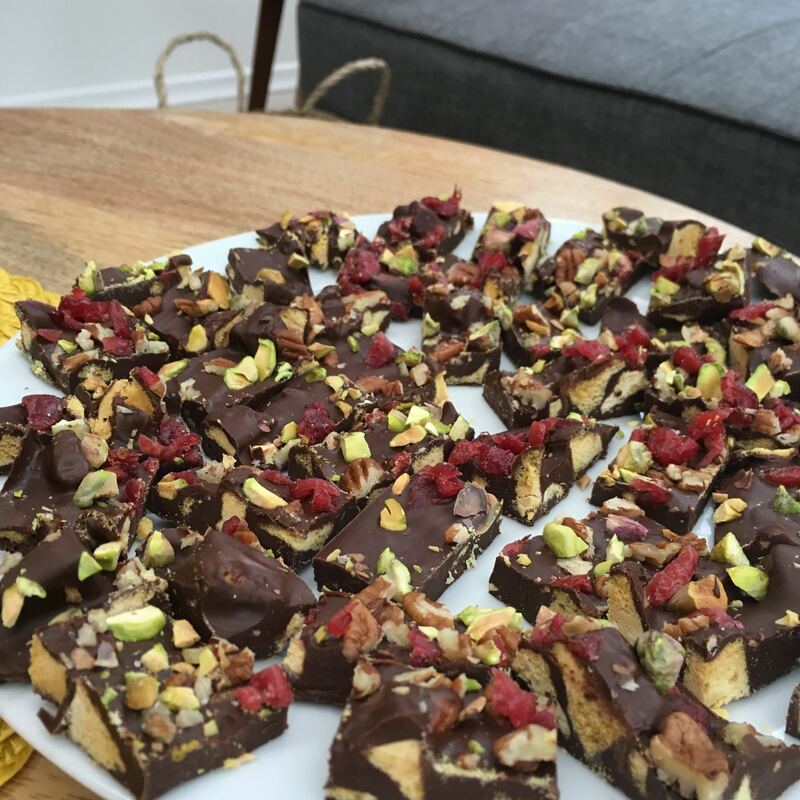 We’re not big on Easter here in the tMatM household, but I do like a good excuse to make a very easy batch of chocolate bark. And Easter, with chocolate for children everywhere, seems like a good moment to redress the balance by making a chocolate treat for the grown ups. 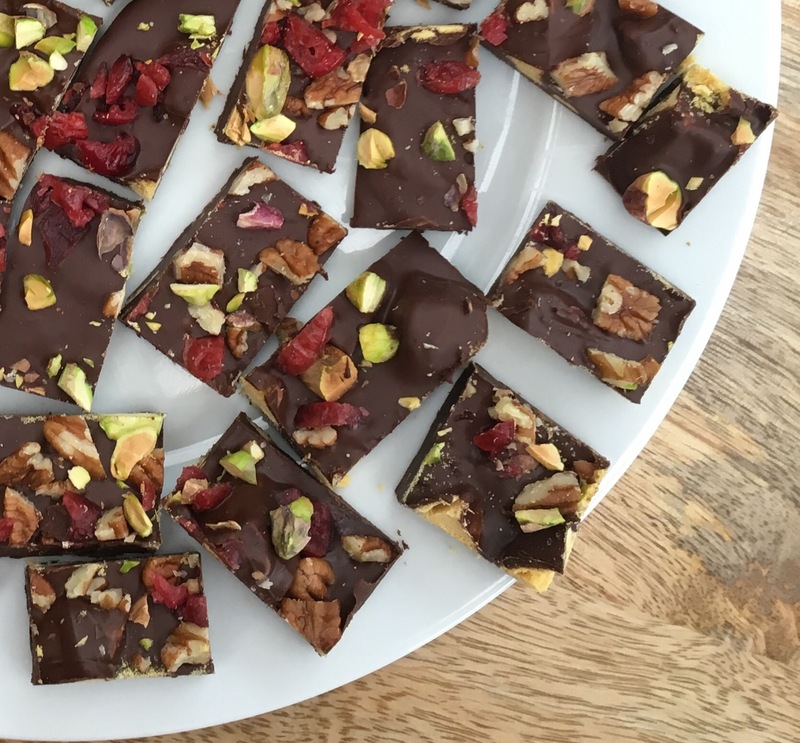 Enter this extremely simple chocolate bark – a treat that looks pretty lovely parcelled up in cellophane and ribbon if you are visiting relatives. And also tastes pretty lovely straight from the fridge, in a frenzied mess as you try to finish behind the fridge door while your 2 and 5 year olds ask what you’re doing. I mean calling it a recipe is a stretch, isn’t it? It’s pretty clear what’s happened here and it’s involved some melted chocolate and a bunch of delightful extras. But in good faith I offer you something of a guide to the melting and mixing. Feel free to swap any or all of the extras for whatever takes your fancy. Line a baking tray – baking paper/ cling wrap. Toast your pecans in a dry frying pan for a couple of minutes. Melt your chocolate, microwave or Bain-Marie, your pick. Go slowly as you definitely don’t want to overheat it. 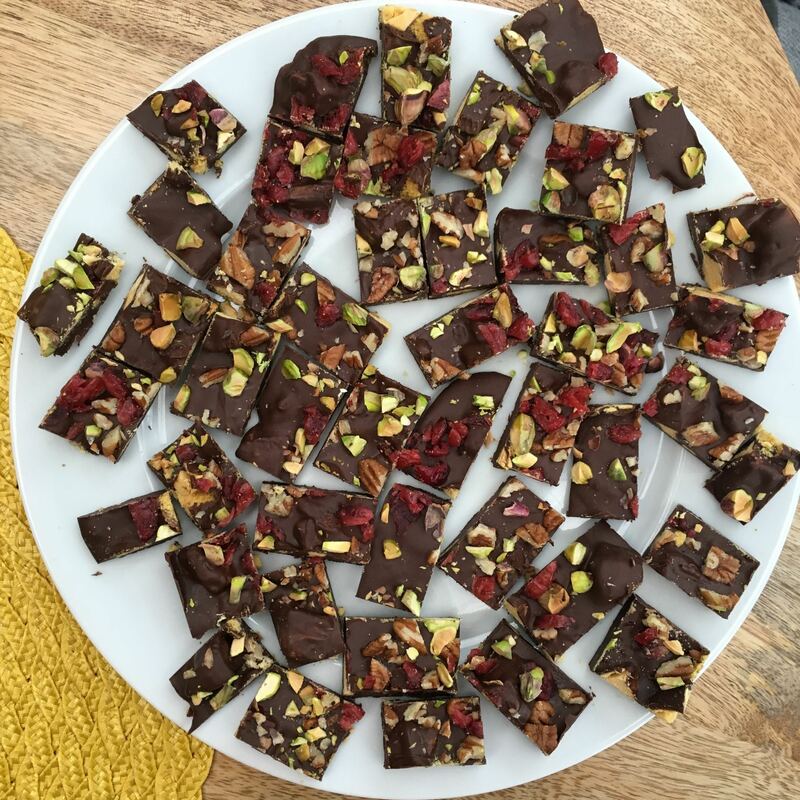 Mix your broken crunchie bar shards into the melted chocolate and pour the whole lot into your lined baking tray, spread it out as thinly as you like. While still warm, scatter your chopped nuts and cranberries over the top. Pop in the fridge to set – a couple of hours. Once cool, turn it out and chop into small bite size pieces – easier to sneak from the fridge without being seen. Smug and Lazy rating: max.